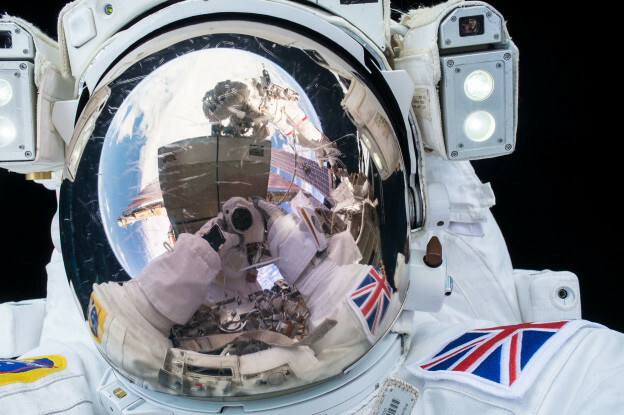 NASA astronaut Tim Kopra and ESA (European Space Agency) astronaut Tim Peake completed the primary task for their spacewalk on January 15, 2016 before it was ended early by Mission Control Houston. The astronauts replaced a failed voltage regulator that caused a loss of power to one of the station’s eight power channels last November, accomplishing the major objective for this spacewalk. The pair ended its spacewalk at 12:31 p.m. EST with the repressurization of the U.S. Quest airlock following an early termination after Kopra reported a small water bubble had formed inside his helmet. “These procedures did their job, the team did their job and we flowed right into a nice, safe return into the airlock for these guys,” remarked NASA’s Chief Astronaut Chris Cassidy, who took part in the July 2013 spacewalk when ESA astronaut Luca Parmitano experienced a similar, but more serious, incident. Commander Scott Kelly assisted the crew members with an expedited removal of their spacesuits and helmets. Once they removed the spacesuits and helmets, the astronauts used a syringe to take a water sample and retrieve the helmet absorption pad to determine how much water was introduced. Engineers are already looking at data to find what may have prompted the water to form inside Kopra’s helmet. The crew was never in any danger and returned to the airlock in an orderly fashion. The 4 hour and 43 minutes spacewalk was the third for Kopra and the first for Peake, who both arrived to the station Dec. 15. It was the 192 in support of assembly and maintenance of the orbiting laboratory. Teams will continue to look over data collected during the spacewalk and discuss forward plans in the days to come. Please let me applaude to your spacewalk success!! How exciting such activities have taken place in that sky we are looking up! I feel it afresh. I really thank you all. By the way.,.’Zinnia’ growm in microgravity is so charming and mysterious! It’s like the one blooming in a far reaches of jungle or southern island. Paradise on the ISS as well as it on the Earth. Your accomplishments with botany are so impressive and inspirational. This Article was very interesting but it was also intriguing and left me wanting to know more. How did the water bubble form inside of his helmet? and why could it potentially be dangerous? Also I was wondering about the romaine lettuce that you guys first grew, and why it had to be tested to see if it were safe to eat? What would have made it dangerous to eat? You guys are amazing and it has always been my dream to one day study cell division and binary fission, and pathology on the ISS. the next time you go for a space walk you should have music playing that you can listen to like on of the actors in that space movie when he was on a space walk. now that would be funny. when you do that you should post a video of you doing it onto youtube so people can see it. I bet you will get a lot of hits on youtube from the video you post on there if you do it and you might get millions of hits and comments from people for doing it. but you know that’s just a idea but I highly recommend doing it just for fun because how often dose someone get to be in outer space and gets to do that. Why not try a desiccant in the helmet? It works to keep moisture out of medicines.